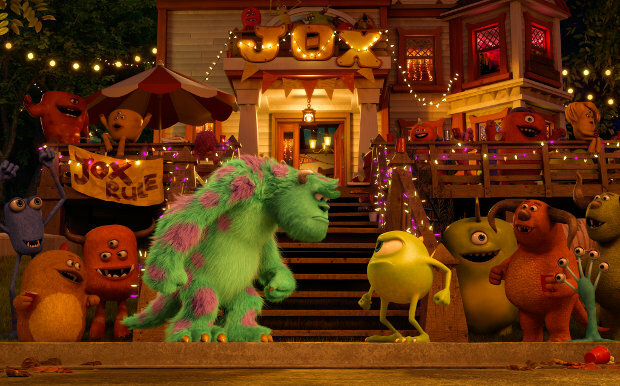 Pixar’s Monsters University arrives on Blu-ray today from Disney Home Ent. touting global illumination for a more authentic look that really pops and a refreshing story about not attaining your dream. Beginnings are often difficult. 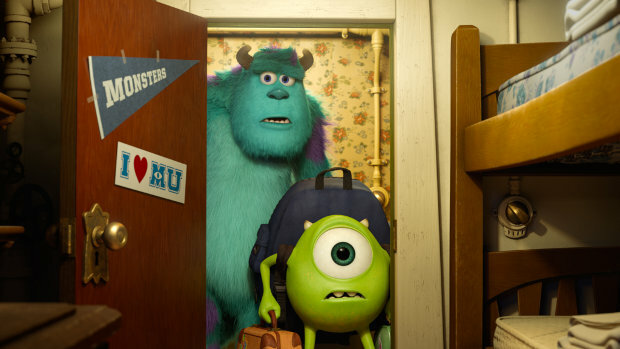 This was certainly true of Pixar’s first prequel, Monsters University, which finds Mike and Sulley meeting for the first time as college rivals and dealing with primal screams. But it’s not often that you find a film about failure, and that’s the theme that makes their story so satisfying as a bridge to Monsters, Inc.
A striking new realism was achieved as a result of a new lighting system Pixar introduced that’s built around global illumination. Global illumination in the past had been render intensive and limited to a single bounce. 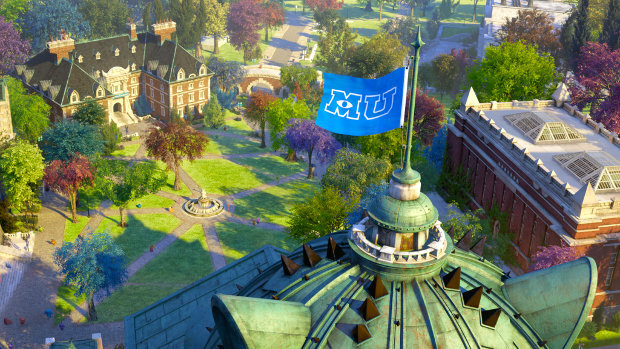 But for Monsters University, Pixar doubled the rendering power and turned the bounce on everything (fur, cloth, grass, trees, water) with ray-tracing that could handle organic objects. There are now 300 to 500 intersecting sources of light, which can be viewed from all angles in a special browser by JC Kalache, the lighting DP. It also made for tighter collaboration between lighting and the other departments so you could add another visual dimension on top of the performance with Mike and Sulley stepping in and out of the light to convey power or vulnerability. With the old system, it took 80% of the time just to set up a shot. Now the upfront process is much quicker and the artists can spend 80% of their time being creative. Therefore, Monsters University was a choreography of light, which you can learn more about in the “Color and Light” featurette, among many educational making of mini-docs. 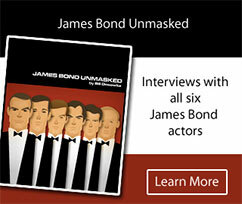 Plus there are several deleted scenes. Speaking of global illumination, Pixar experimented with the new lighting system on The Blue Umbrella short, which is also one of the bonus features.